It’s wedding season again with love and dancing in the air. Nothing really tops off a wedding quite like a champagne toast. Something about popping that cork makes it seem so official! So why not gift the bride and groom an amazing bottle of champagne that they can enjoy on a future anniversary or special occasion? 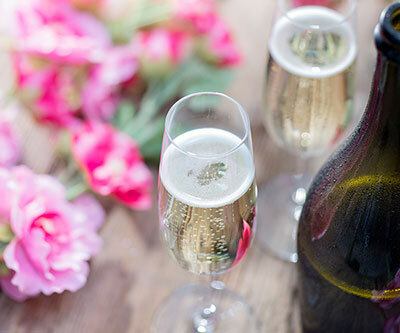 If you’ve recently received a wedding invitation, or are certain one is coming your way, here are five champagnes to gift the future Mr. and Mrs. this year. Delamotte Brut - Uncork this wine to find that the warm bread, nutty and ginger accents will give you that blissful wedding day feel. With its vibrant aromas of lemon pith, pear skin and honeysuckle, it pairs perfectly with a fruity dessert like raspberry wedding cake. It’s priced at just $37.95 and over-delivers in quality. P Moncuit Cuvee Delos Blanc de Blancs Brut - This is Dave Sokolin’s pick, and he serves this bubbly at all of his events. It tastes like a $150 bottle. And who needs a bouquet when you can carry this floral beauty down the aisle? With a price tag of only $38.95, this is quite the steal for a wonderful wedding gift that the couple will love! 2008 Pol Roger Brut - Get the bride and groom something they can celebrate down the road with this vintage brut. With a blend of 60% Pinot Meunier and 40% Chardonnay, it’s a beautiful blend of apple, white peach and fresh nutmeg. Even though it’s been aged over 10 years, this is still a young bottle and can be a great future anniversary toast- so remind them that patience is a virtue, especially in marriage! 2009 Moet Chandon Dom Perignon - Dom Perignon is truly something special. The 2009 vintage has a 97 point score and a creamy mix of fruit and a fine texture. Dom Perignon is a classic, one of the most recognized labels in the world and sure to be a memory the bride and groom will forever cherish. 2008 Louis Roederer Cristal - The 2008 Cristal is an epic wine, scoring 100 points from three different critics – Wine Enthusiast, James Suckling and Jeb Dunnuck. It’s the best Cristal since 1979, which trades for $1,000+ per bottle (vs $269 for the 2008 vintage). You’ll find apple and citrus flavors working with the tight minerality to give a textured yet fruity wine. The couple can pair it with their frozen wedding cake and relive the most wonderful day of their lives.